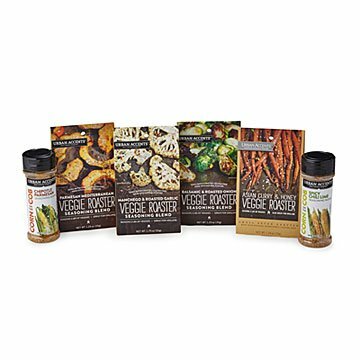 This collection of six distinctive seasoning mixes is designed for a variety of veggies. From a Parmesan Mediterranean mix for roasting vegetables to Chili Lime spice to sprinkle on your corn on the cob, this collection of six bold seasoning medleys offers enticing accents for a variety of vegetable preparations. Encompassing complex, sweet and savory flavors, they'll help your veggie side dishes take center stage of your meal! Made in Chicago. Bought this as a gift for a Vegetarian friend who does lots of meal prep. This was perfect for her to mix things up a bit! This is different seasonings for food. Perfect for the vegetarian in your life. I purchased this for a friend who loves gardening and cooking. As part of his retirement, he loves to cook for others and I felt this would spice up his life with some new inspiration. Guaranteed flavor explosion with this seasoning powder!! Bought this for an early father's day. He loved it. The flavor combinations are amazing. They compliment and create the perfect savory balance. Our daughter and son in law are at the stage in life were they need nothing and don't want anything-I can always find something they really enjoy and it's fun shopping for me-I feel creative when I'm done. I love all these spices and especially the chili lime. Sure wish they were sold separately. This gift arrived at my sister-in-law's just before I did. The box is attractive and I'm happy to give a consumable hostess gift. This was part of my Christmas gift to my parents, which had a cooking theme to it this past year. My parents have absolutely raved about the spice collection since, with my mom telling me that they will likely be ordering more for themselves. This was given to a family member as a Christmas gift and they just loved it. They grow their own vegetables and couldn't wait to use the spices. Great for all veggie lovers. Bought as a gift for a friend. She loves them.